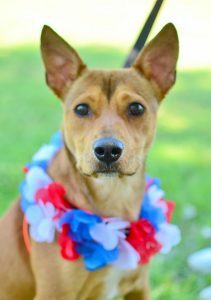 Dill appears to be a young, mixed Carolina Dog. He is medium-sized, has the tell-tale tall ears, well-developed chest, and tucked up belly that are signature features of the breed. Another indication is that he’s a bit bashful. After learning that you’re a trustworthy soul, he will craftily sneak kisses and retreat to watch for your reaction. He finds security and comfort in order and calm. Allowing him to be in his comfort zone will help him to naturally and easily learn to step outside of it. Like a true puppy dog, he loves toys and to run around the yard. This young and active guy needs plenty of room to romp and play. Matched with the right person, Dill will be an amazing and loyal companion dog. Petite and delicate Munchie is as beautiful of a cat as there can be. 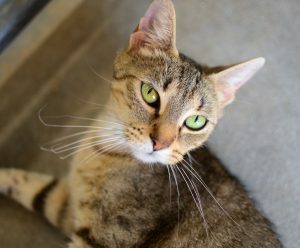 Her apple green eyes are mesmerizing and her multi-colored coat of yellow, tan, and orange, with contrasting black tabby stripes, make her a visual stand-out in any crowd. Couple her looks with her laid back and loving personality and this cat is the whole package! She likes other cats and dogs and people of all ages. Munchie is a turn-key pet, if there ever was one.